Click here to preview this training video. Click here to purchase the video. 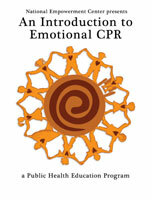 Emotional CPR: Saving Lives, Healing Communities - Webinar Archive Now Available! Click here for the archived webinar recording. CARF International cites eCPR as “a holistic, empowering approach to assisting persons served to cope with emotional crisis” in their Behavioral Health Standards Manual. eCPR is included as an example of staff training in the use of alternative interventions. CARF accredits health and human services, including behavioral health, on five continents. International Association of Chiefs of Police. Building Safer Communities: Improving Police Response to Persons with Mental Illness. Click here to watch this informative webinar from 2012 which describes the fundamental concepts of Emotional CPR. This workbook was developed for the eCPR certification training and provides a thoughtful discussion of the values of eCPR, the features of dialogue, and the primary components of eCPR: C = Connection, P = emPowering, and R = Revitalizing. 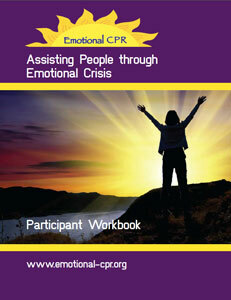 Other sections include how to prepare oneself to provide eCPR as well as tips for self-care. The workbook is filled with inspiring quotes, real-life examples of embodying the practice of eCPR, sample instructions for role plays, and other exercises. The workbook is designed for anyone who may encounter a person in emotional crisis - law enforcement, mental health peers, mental health providers, family members, and others. The Connecting process of eCPR involves deepening listening skills, practicing presence, and creating a sense of safety for the person experiencing a crisis. The emPowering process helps people better understand how to feel empowered themselves as well as to assist others to feel more hopeful and engaged in life. In the Revitalizating process, people re-engage in relationships with their loved ones or their support system, and they resume or begin routines that support health and wellness which reinforces the person’s sense of mastery and accomplishment, further energizing the healing process. eCPR is based on the principles found to be shared by a number of support approaches: trauma-informed care, counseling after disasters, peer support to avoid continuing emotional despair, emotional intelligence, suicide prevention, and cultural attunement. It was developed with input from a diverse cadre of recognized leaders from across the U.S., who themselves have learned how to recover and grow from emotional crises. They have wisdom by the grace of first- hand experience. For more information, to schedule an introductory workshop or a certification training in eCPR, or If you would like to be an eCPR Ambassador and help spread the word about this exciting program, send us an email via the contact form, or call 877-246-9058. Emotional crisis is a universal experience. It can happen to anyone, at any time. When we are exposed to this extraordinary situation, we develop amazing and creative ways to protect ourselves, To onlookers, these protective mechanisms may look very odd, even "crazy". To us, they have meaning. Through using eCPR we can better understand and overcome our fear of seemingly unusual behavior brought on by an emotional crisis. Through eCPR we learn how to form supportive connections that empower the person in emotional crisis so they are able to feel revitalized and quickly resume meaningful roles in the community.